Carbon dioxide (CO2) extraction is commonly used to make various food and other products – and it’s becoming increasingly popular for extracting top quality cannabis oil high in cannabidiol (CBD). In fact, subcritical and supercritical CO2 extraction is rapidly becoming the preferred method of extraction in the medical cannabis and therapeutic hemp industries; particularly with larger commercial operations. As we mentioned in our guide to cannabidiol (CBD), cannabis oil is usually extracted on a commercial scale either through the use of solvents such as hexane or butane, or through more modern supercritical/subcritical CO2 (carbon dioxide) processes. Carbon dioxide based extraction is considered to be more environmentally friendly, considerably safer, cleaner, cheaper and less toxic than using fossil fuel based extraction – and results in a consistent product that is more palatable. What Is Supercritical Carbon Dioxide (ScCO2)? At standard temperatures and pressure, carbon dioxide is a gas. At 60.4 psi it’s a liquid and at -78C at standard pressure, it’s a solid (dry ice). When heated to above 31.10C (critical temperature) and at 1,071 psi (critical pressure) or higher, it has the properties of both a gas and liquid. It becomes what’s known as a supercritical liquid. Supercritical liquids can pass through porous solids and also dissolve materials, making them ideal as a solvent. The “tunability” of supercritical CO2 extraction enables targeting maximum outputs of cannabidiol depending on the type and quality of cannabis material being used; while keeping undesirable compounds such as chlorophyll out of the product. An extractor chamber is filled with ground cannabis/hemp material (called trim). A pump forces pressurised carbon dioxide gas at the optimum temperature (ScCO2) into the extractor chamber. The supercritical carbon dioxide interacts with the cannabis, dissolving the cannabinoid compounds it contains. The supercritical CO2 carries the cannabis oil particles past a pressure release valve to a cyclonic separator. In the separator, the pressure is lower and the carbon dioxide and cannabis oil separates. The carbon dioxide rises and is routed back to the CO2 tank for reuse in the case of a closed loop system. The cannabis oil, waxes and resins descends in the separator where they are captured by a collection vessel. The resulting substance is processed further into various products, such as CBD-rich “cannabis oil”, free of any solvents. It all seems quite simple, but the equipment involved is very expensive; costing from tens of thousands of dollars for small units and running into hundreds of thousands of dollars for a cutting-edge setup with a 60 litre extractor capacity. Top-end equipment can also separate individual desired compounds as the extraction process is occurring (fractionation). While pricey, supercritical extractors compare well to the cost of other solvent based approaches when taking into account the safety equipment and special facilities legally required in some countries for working with flammable solvents. ScCO2 extraction may be safer, but given the pressures involved and the need for accuracy; it’s not the sort of equipment you’d want to purchase off an online bazaar or use without a significant amount of training. The quality of supercritical CO2 equipment is definitely not something worth cutting corners on. Subcritical CO2 extraction is the same sort of process, but supercritical occurs at higher temperatures and pressures. In subcritical, the carbon dioxide remains in a liquid state. The difference in temperature and pressure results in a very different cannabis product. Winterization involves mixing the substance with ethanol (alcohol), then placing it in a freezer for around 24 hours; which crystallizes the fats and waxes. The deeply chilled liquid is then run through a filter, leaving the fats and waxes behind on the filter paper. The filtered ethanol mixture is then evaporated (reclaiming the ethanol in the process), leaving pure and cannabidiol-rich cannabis oil. Subcritical CO2 extraction produces a substance with a consistency more like molasses. The subcritical product also preserves cannabinoids other than CBD; which may or may not be desirable. While the ScCO2 process may destroy various cannabinoids through thermal degradation, it yields more cannabidiol – and in a far shorter time. Supercritical oil extraction also kills off nasties such as bacteria, mold and other forms of contaminants that could prove problematic for people with already compromised immune systems. One of the advantages of using a supercritical system is that it can be used for subcritical uses as well; whereas vice-versa isn’t possible. Using a fractional extraction approach, lower temperature and lower pressure can be used to extract an oil suitable for applications such as vaping. Then by raising the temperature and pressure, the heavier compounds can then be extracted. This approach extracts the most from the same amount of trim material, with less additional processing. Very generally speaking, the ScCO2 method of extraction will produce around 10% “true” cannabis oil based on trim weight; however if you add in the resins and waxes that may be desired in some applications, yields may be anywhere from 17-25% of product. 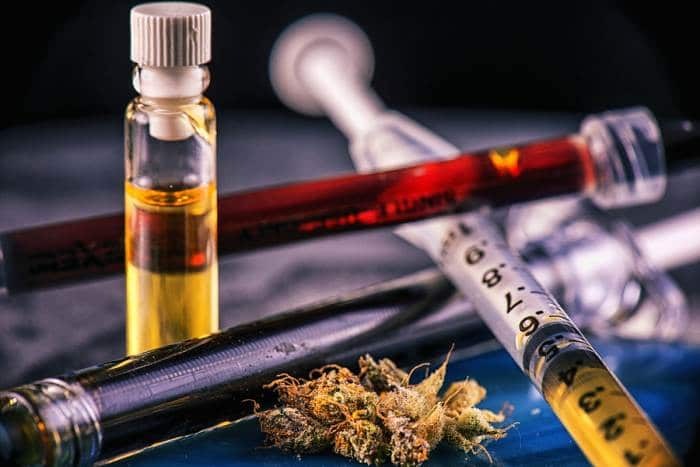 It really depends on the application as to whether supercritical or subcritical extraction is the best choice for cannabis – and it’s one of those topics that is hotly debated in the industry. However, a system capable of working at supercritical temperatures and pressures provides the most flexibility.